high-end diving suits, fins made of carbon fibers and wooden spearguns. After successfully establishing itself in the special field of underwater activities, the business has entered the field of shipbuilding, namely inflatable boats for use in diving operations. 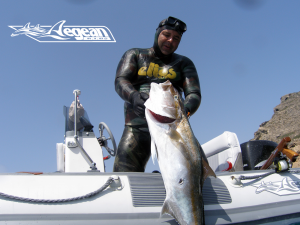 In 2002, after two years of tests and experimentation, the first specialized rib inflatable boat, named Aegean 444, was released for use in spearfishing. The boat was a great success, achieving the highest number of units sold in its category and others as well. Other models followed with success, making Aegean ribs known abroad, where exports take place nowadays.Today, models by Aegean ribs range from 3.60 to 11 meters, featuring a flexible design and manufacturing depending on customers’ needs (custom made). the Aegean Sea (Adventure Tours in the Aegean Sea). George Ioannou was born in Pireaus and is a 2** free diving trainer of the Greek federation, ex-champion of underwater fishing in Greece and member of the national team with participation in world and European championships, and an expert operator of speedboats and sailboats.